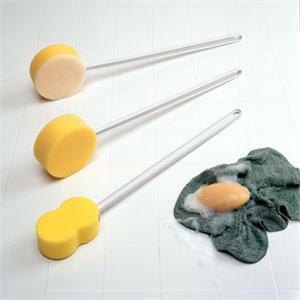 Polyfoam sponges on white, plastic handles can be customized with heat gun and bent to a desired angle. Sponges are treated with an antibacterial agent that prolongs sponge life. Loofah/sponge features synthetic “loofah” on one side and a polyfoam sponge on the other. Total length 22-1/2". Latex free.